It does not support shared folder. Technical issues can arise routinely. Improper internal setting can cause application to crash. Error messages use quite indirect language and does not provide a clear picture towards the error. User-interface of the software is not as attractive as other email platforms. Adopting new Business Technologies – Exchange Server can be a great emailing platform, if your organization is accepting new business technologies or making changes into existing requirements that no longer cannot be fulfilled using your current GroupWise platform. Merging with Another Organizations – If the other organization, which you are merging with, has standardized on Exchange Server platform then your business may need to soon move to Exchange Server platform to maintain smooth emailing communication. Cloud-supported Emails – GroupWise has very limited support for cloud-based services, whereas your organization can take this advantage using the off-premises cloud services by Microsoft. 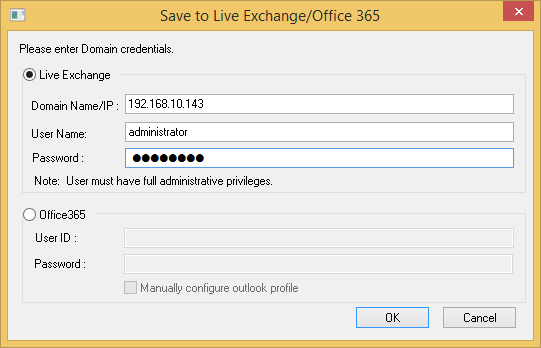 Anywhere Mailbox Access – With Exchange Server, the users have the flexibility to get access to their emails, contacts, calendars, voicemails and everything else from any location using their laptops or handheld devices with Exchange Server and Outlook Web App. Enhanced user productivity – Microsoft products like MS Office are already familiar to the users, and it requires no necessary training. They can simply start working on their favorite user interface (such as mobile devices) after integrating their device with Exchange Server. On-premise solution (private cloud services). Hybrid solution (including both on and off-premise). Step 1 – Follow GroupWise Console >> GroupWise Agent Settings >> Enable SOAP. Here, check the Enable SOAP. Step 2 – Get the user list from GroupWise ConsoleOne portal. Step 3 – With the help of administrative credentials, create a trusted Application Key. This Application key will help in the migration process. After completing all the prerequisites, you can easily initiate the migration, you can use any professional tool to complete the migration. 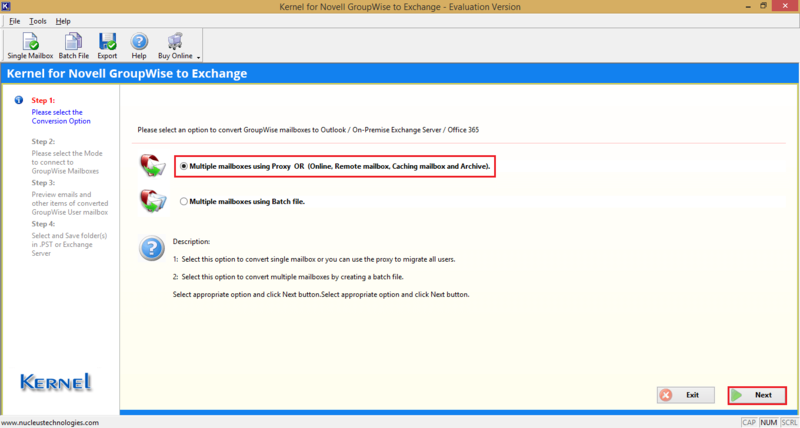 Although, you can use ‘Migration Wizard’ method to manually extract mailbox data from GroupWise and then migrate them to Exchange Server. This wizard gives you the flexibility to migrate either in a single-or dual-step process. 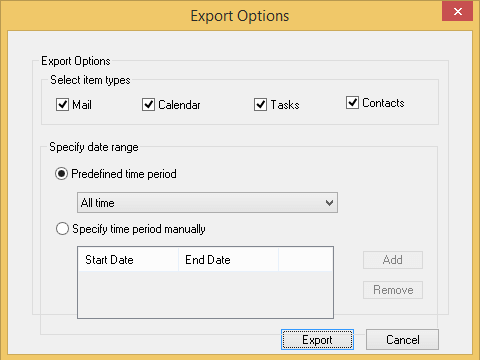 When choosing single-step process, then you can fetch data from GroupWise and import it to Exchange by executing the wizard for single time. However, the dual-step process can be used when the single-step process fails to migrate the data. This second method is helpful to migrate data when GroupWise server is not in a good health or there is some difficulty in sustaining the connection to it. 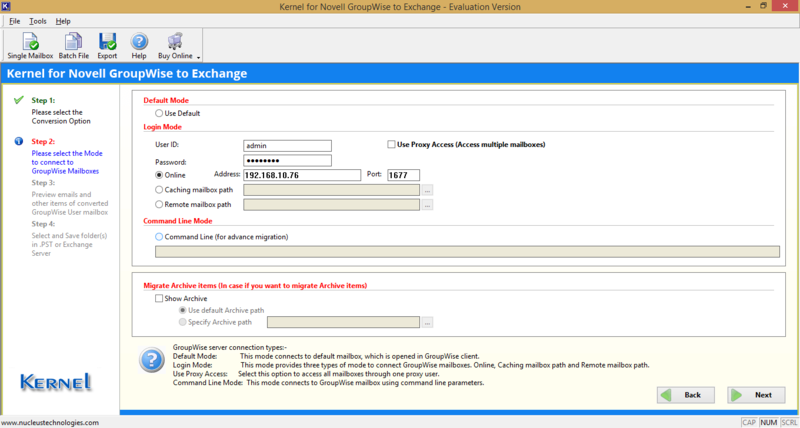 Kernel for GroupWise to Exchange Server is a perfect migration tool to move bulk of user mailboxes from GroupWise to Exchange Server. 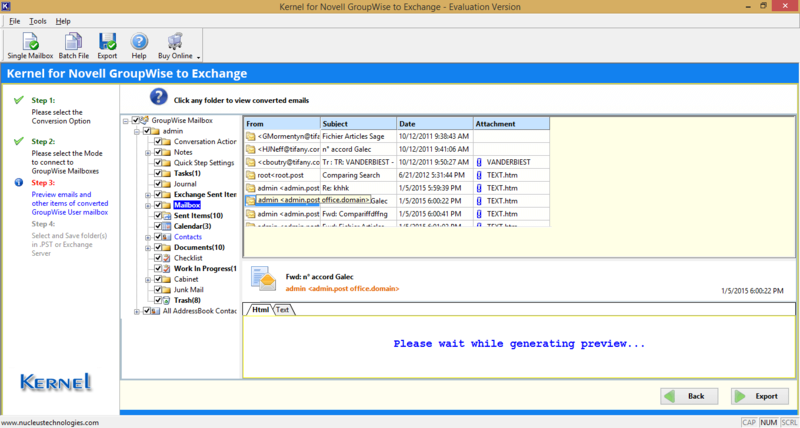 This GroupWise to Exchange migration tool can provide fruitful results to smoothly migrate GroupWise user’s cache or remote mailboxes, archives to Exchange Server in a single attempt, where the migration wizard fails to render it even in multiple attempts. 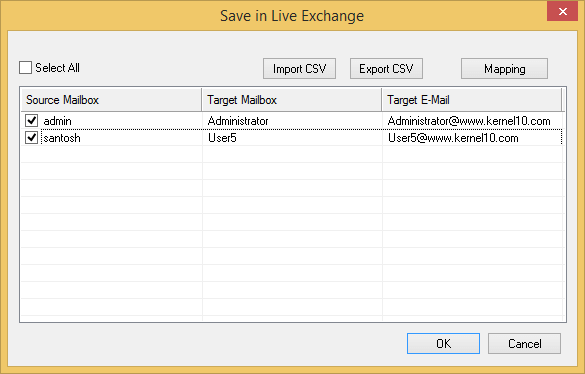 Multiple mailboxes using Batch file. After selecting the option, click Next. Step – 2. Now there are multiple modes like Default Mode, Login Mode, and Command Line Mode. Whatever mode you choose activates its parameters. There is also another option to migrate archive items. In the current case, Login Mode is activated. In Login mode, input the User ID, Password, Online Address, and Port number. Then click Next. Step – 3. When tool retrieves the mailbox, it presents all data items in a tree structure. You can select any type and get its preview. After getting the preview, click Export button. Step – 4. 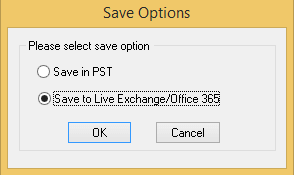 Select the second option, save in Live Exchange/ Office 365. Step – 5. Input the Domain Name/IP, username, and password. Step – 6. 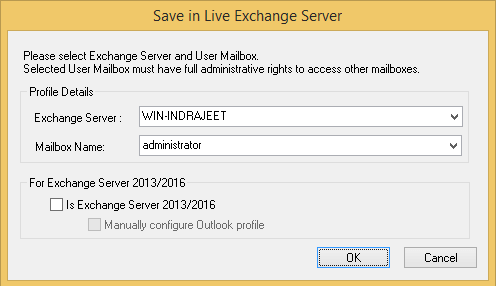 First select the exchange server and then select the desired destination mailbox. Step – 7. Map the source mailbox with destination mailbox. Step – 8. 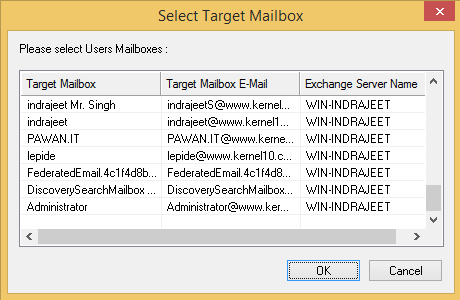 Select the number of mailboxes that you want to migrate. Step – 9. Perform the filter operation and select the suitable item types or get a date-range. Step – 10. The migration starts. You can click Stop button and cancel the further migration. 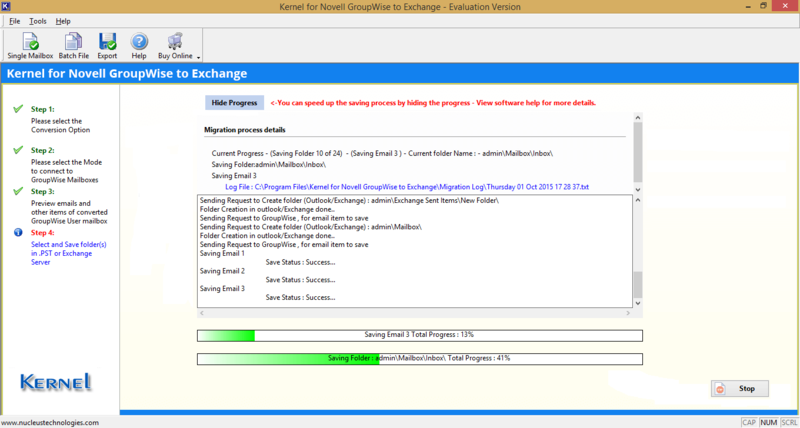 After using Kernel for Novell GroupWise to Exchange migration tool, you will feel that it has reduced the complex migration process to its minimum level. It will be quite beneficial for you to migrate your GroupWise mailboxes to Exchange or Office 365 as Exchange Server offers a great number of benefits and safe & flexible environment for your data.